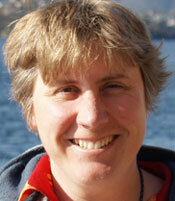 Beth Fulton obtained her BSc (with first class Honours jointly in Mathematics and Marine Biology) from James Cook University in Townsville in 1997 and her PhD on ‘The effects of the structure and formulation of ecosystem models on model performance’ at the University of Tasmania in 2000. She joined CSIRO in 2001 as a postdoctoral Fellow, looking into robust indicators of the ecological effects of fishing. It was at this time she applied the lessons learnt in her PhD to begin the serious development of the ecosystem model Atlantis and to begin co-developing InVitro. She was appointed to CSIRO as a research scientist in 2004, eventually taking up leadership of the ecosystem modelling and development team. The Atlantis computer model was rated the world’s best for strategic evaluation of marine fisheries management issues by the United Nations Food and Agriculture Organisation. It is used to provide strategic advice to management bodies in Australia, the United States and Europe. The InVitro computer model, which she co-developed, allows users to explore the impacts and management of the myriad pressures on marine and coastal environments. These models were the first ones in the world to give equal attention to biophysical and human components of marine ecosystems. Fulton EA, 2009, Personal communication.